Listen to all kinds of music. Listen to human speech. Listen to the sounds of nature. Listen analytically. Try to extract the essence of the sounds you hear. Use the sound or riff you select as inspiration. It is not necessary to copy the sound you hear exactly. Your job is to create a melody not to create a documentary. Build motives using at least two but no more than six tones. Experiment with time signatures, tempo and key. Be as inventive and as experimental as possible at this stage. Don't throw away the motives you don't use immediately. Store these so that they are available for future compositions. Think of the phrase as a sentence. The motive opens the sentence. The phrase completes the sentence by a logical expansion and closure of the motive. A phrase is a complete musical idea and a phrase must either conclude or clearly link to the next phrase. Take time to get the phrase right and proper to fit the goal of your melody. You will need at least two complete phrases to for each part of the melody you create. Most structures will be based upon the Verse-Chorus or A-B structure. In this two part design each part will also have two phrases. It is sometimes desirable to use two distinct phrases in Part A and only one distinctive phrase in Part B with one of the Part A phrases repeated. Make certain that the structure supports the intent of the melody. It may be that a strophic structure of a single phrase is best for the task at hand. It may be that the job calls for a three part melody. You may not know what structure is best until you are well along into creating the melody. 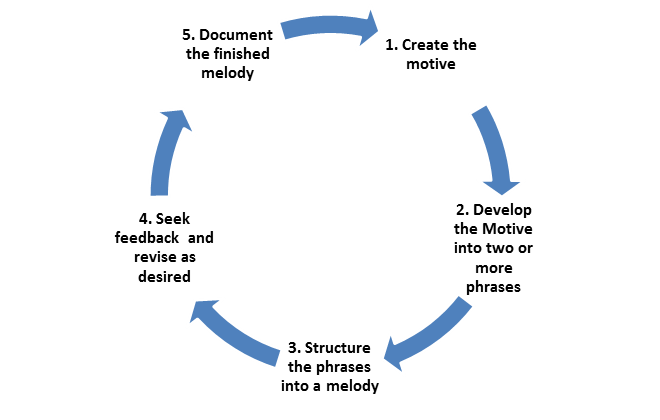 Creating the motive, expanding motive into phrase and deciding upon the final structure are all iterative processes. You might get it right the first time. Odds are there will be several to many attempts to find that magic thing that makes melody work. Find people who will candidly offer advice about your draft melody. Listen to their feedback. Use what you can to improve the melody you have created. Feedback from both musicians and non-musicians is helpful. A musician may offer technical advice. A casual, but thoughtful, listener may provide feedback about how a melody is perceived without any consideration of the the nuts and bolts inside the music. Both types of feedback are valuable. Getting feedback is another reason to produce your music so that others who are not in your physical presence can offer feedback. Some writers work in teams to create melody. Collaborative songwriting teams have a record of strong results. Much depends on artistic taste, musical goals, level of expertise, and personality. Collaboration isn't for everyone and isn't for everyone all the time. There are occasions in which one team member writes and the other team member edits. Having a collaborator means having feedback. Your work is not finished until it has been documented. Do that by recording or transcribing. Document your melody and store it. This new melody builds your body of work and will inform all future melodies you create. Don't let it vaporize. Document your melody. This course has labored over many technical details. All of them are important. But none of them are so important that they should obscure the point of creating melody. Human beings have been creating melody since before our species developed language or writing. Just as our our distant ancestors did, we work at creating melodies because we have a deep-seated need to communicate, to say something important and in doing so to share an experience of being elevated with our listeners. Master the techniques in this course. Internalize them. Let your creative-self get on with the most ancient of shared human art experiences - creating melody.